These vibrant animal socks with ears and wings are so playful and attention-grabbing, you may want a whole set. The colorful characters have movement, too, with the ears or wings flapping as you walk. Designed by Russian YouTube star Olga Kay, each pair ensures you’ll stand out. Their soft, stretchy material reaches knee high and has a non-skid bottom to add even more conviction and personality to your stride. Dimensions: 3" x 19" x 0.5"
These socks with ears pledge to add color and personality to your outfit. Each pair of this knee-high hosiery has its own vibrant personality, complete with little ears or wings that flap when you walk. Maker Olga Kay is a trailblazer. At 14 she left her small village in Russia to join the circus and eventually became a famous YouTube personality. 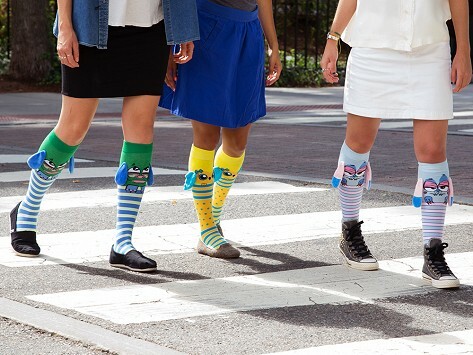 When she designed MooshWalks she knew for certain they had to stand out and start conversations. Olga did that and more. Wear a pair and you’ll definitely be noticed. Even though the socks are attention-getting, we found them to be soft and durable, too. We suggest wearing them with a dress or shorts to ensure a full-length view of the lively, lighthearted characters.